The first time I walked in, I knew this place would work for me. Now eight months in, I can confirm that my feeling about Workbar in Central Square was right. Since I joined in June 2018, I’ve made significant progress building my business, and have made great personal connections. Sadly, it’s time for me to take a hiatus from Workbar, but not before sharing what I liked and what can be improved. One of the main reasons I have enjoyed my time at Workbar has been the space itself. Natural daylight streams in from all sides, supporting my circadian rhythm. The carpeting, furniture, and decor is colorful enough to give energy, yet sober enough to say “this is a place for work”. The one noticeable downside has been that the air quality significantly drops on busy days. Thankfully, the balconies offer a welcome breath of fresh air. The Commons, my go-to neighborhood within Workbar’s coworking space in Cambridge. I opt for this zone because the buzz of light conversation stimulates my creativity, and because there are plenty of standing desks. The workstations themselves are satisfactory, especially for divergent work. I have favored working from the high tables that afford standing and sitting. One issue, however, is that the tabletops do not give much visual isolation. I have found this to be a challenge when completing high focus work. When writing, for example, I have been easily distracted by people passing by. This is not always an issue, however. When working on graphics, the openness has been great. My workstation today. The monitor helps not only for productivity and ergonomics, but also to shield from visual distractions, e.g. the person working directly behind it. Workbar does a great job of supplying tools and amenities. I have used a secondary monitor every day to support my productivity. The space now even supplies external keyboards. On the amenities side, I’ve been happy with the selection of quality teas and the sparkling water tap. The morning fruits and afternoon snacks have been welcome too. Not all is ideal, however. One of my bigger struggles with the Central Square space has been the lack of personal storage. While Workbar does offer some lockers for a monthly fee, there is no secure place large enough to leave a 15” laptop overnight. This means I have carried my electronics, chargers, snacks, and documents with me every day. I’ve managed to fit this into two bags, which have been cumbersome to carry, especially when I’ve taken the hour-long bus commute. This also made for a heavy load for the few times I have cycled. Workbar could alleviate this situation and turn it into a revenue opportunity by offering larger lockers, as they already do at their location in Back Bay. 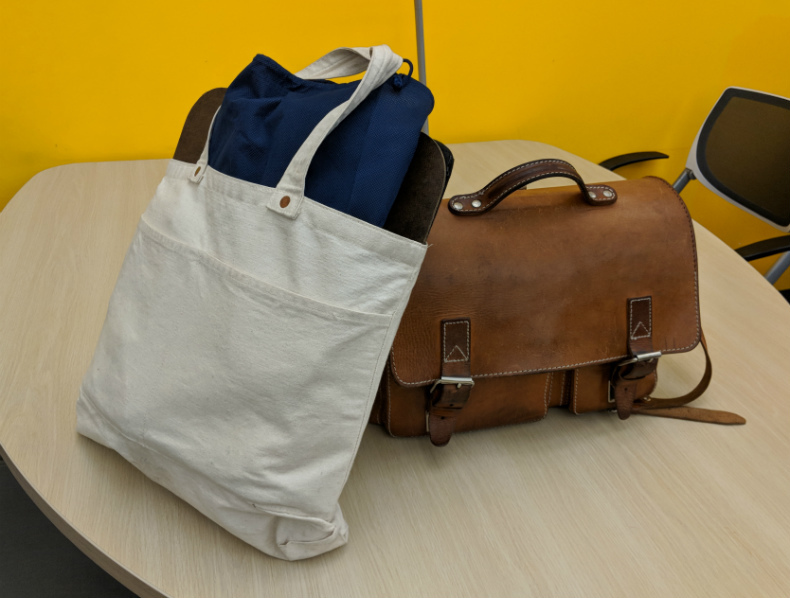 The bags I carry back and forth from my coworking space. What’s inside? Laptop, charger, notebook, snacks, clipboard, drawing tablet, comfortable pair of shoes. Not so convenient for my public transit commute, let alone cycling. An aspect that is not always obvious, but that my coworking space has managed well is the space utilization. From my observation, the flexible seating areas are never more than 65% occupied (generally 4 people to a 6-person bench). Practically, this means that I have almost always been able to find a place to work in my preferred zone, no matter when I arrive. This relieves the stress I have felt in a previous workplace, where there was a high chance all desks were taken if I arrived after 9:15 am. The other benefit of this utilization rate is that it gives us room to think. The workbenches would simply feel too cramped with three people elbow-to-elbow, facing another three. A key component of Workbar’s success has been its neighborhoods. Workbar has created four activity-based zones in its space: the Study, the Commons, the Switchboard, and the Café. In the Study, no conversations are allowed, and white noise plays overhead to dampen acoustics. This has been a great place for me to seek refuge for high-focus work. In the Commons, conversations are welcome, but phone calls are not allowed. This zone has been my go-to, because it has ample standing desks, and its buzz stimulates my creativity. In the Switchboard, conversations and phone calls are allowed. This is also the only space with desks that have visual dividers. I’ve ventured into this space primarily to take phone calls. In the Café, soft music plays and Workbar’s community managers often host events. This has been a great place to take a break and meet other members. Workbar’s behavioral guidelines for the quietest neighborhood, the Study. Workbar has four working zones, with escalating levels of stimulation. The selection provides choice to support personal preferences and different working modes. The main reason for the success of the different zones has been compliance to the guidelines. In the Study, I have heard a conversation only once or twice, at which point a coworker was quick to ask the offending person to quiet down. In the Commons, my neighbors have generally been great about keeping conversations quiet, short, and relevant to their work. This compliance has greatly supported our productivity. I can’t say that everyone has been as sensitive to their neighbors, however. My ability to get work done has been challenged particularly by the behavior of one organization. Unaccustomed to the culture of our coworking space, upon first moving in, the organization held meetings and conversations at lively volume in areas that had previously been quiet. In addition, their employees tend to speak unabashedly at volume about non-work topics. To their credit, they have learned to adapt. Nevertheless, their operations-intensive focus still creates significantly more verbal interactions than the number that occurs between people who work independently. This imbalance in behaviors has contributed to my decision to take a hiatus from the space. Workbar’s member retention will depend on its ability to match and regulate member behavior. Besides the space, Workbar’s other great value has been the community of members. From the beginning, I felt that these are my people. Overwhelmingly, they are kind and interested to get to know their co-workers. They also know not to bother each other when they are heads-down. This community is one of the main reasons I have come to work here, to be in a social environment with people who root for each other. Another aspect of the community that I have greatly enjoyed is our mutual trust. Two main factors contribute to this. First is the familiarity we have with each other, second is the protection from the outside (our upper workspace is card-access only). Thanks to this trust, many of us leave our belongings unattended when stepping away from our desk. I have yet to hear of someone’s smartphone or laptops being taken. When taken in perspective, this mutual trust is one of the main aspects that differentiates our coworking space from a coffee shop. An area that can stand to be improved, however, is the rather small degree to which we support each other professionally. One of the challenges is that our fields of practice are so varied. We are software developers, marketers, writers, lawyers, and sustainability entrepreneurs. With little perceptible overlap, the opportunities to help each other with professional matters have not been obvious. This can even stunt conversations. In one of my workshops, I vividly remember one lawyer expressing frustration that no co-worker would engage him in political discussion. Thanksgiving lunch at Workbar, a great event to get to know fellow members on a more personal level. Workbar offers several such social events, and can stand to improve by offering more events with professional appeal. The incongruence in professions also has an influence on the type of the events that are offered at Workbar. The community events have been overwhelmingly social: bagel breakfasts, thanksgiving lunch, happy hours. These have been great occasions to connect with coworkers, but they have offered little professional value. There have been some events, however, that have offered more professional value. These have been primarily hosted by members, and have been less frequent. One example includes a session on optimizing your LinkedIn profile for generating leads. As Workbar continues on, I recommend that it offer more professional-oriented events. Altogether, I have been very satisfied with my experience at Workbar in Central Square. During my time here, I have been able to build my online presence and my content writing business. I’ve also made great connections. So you might be wondering why I’m taking a hiatus. I’m in an effort to shorten my hour-long commute and tighten my budget, so I’m primarily working from home. I have to admit, though, that I’m not as productive as at Workbar, so I wouldn’t be surprised if I’m back again soon. Maybe I’ll see you there! Tobias Froehlich is a workplace consultant. He guides organizations to enhance team effectiveness and well-being by optimizing workplace layout and behaviors. Visit his website to learn more.